It’s no secret that recently that the border security crisis has been a big topic, whether you are for or against it. Many believe that a wall is a solution to the illegal immigration problem in the United States, while others still think that we should just let the immigrants in regardless of legality. For now, all that is set up is a 20 foot tall, metal fence. Recently, much of that fence has been covered in 5 to 6 layers of razor wire on the United States side of the border wall to further deter people from entering the country illegally. For clarification, razor wire is not the same thing as barbed wire. Barbed wire is made with several different strands of wire wrapped around one another that occasionally break off from the group to come together at points that are painful, however not deadly, to the touch. Razor wire has a similar construction, only the points are substituted for blades very similar to razor blades. While razor wire is not lethal to the touch, too much of it can become a serious hazard for human safety, because it can lacerate the skin which can make the victim bleed out. The point in a situation like this is as a deterrent, sending the message that the United States does not want you to cross the border illegally. The deterrent aspect of the razor wire is in direct contrast with the town’s viewpoint on the matter, calling the wire inhuman and not aesthetically pleasing. 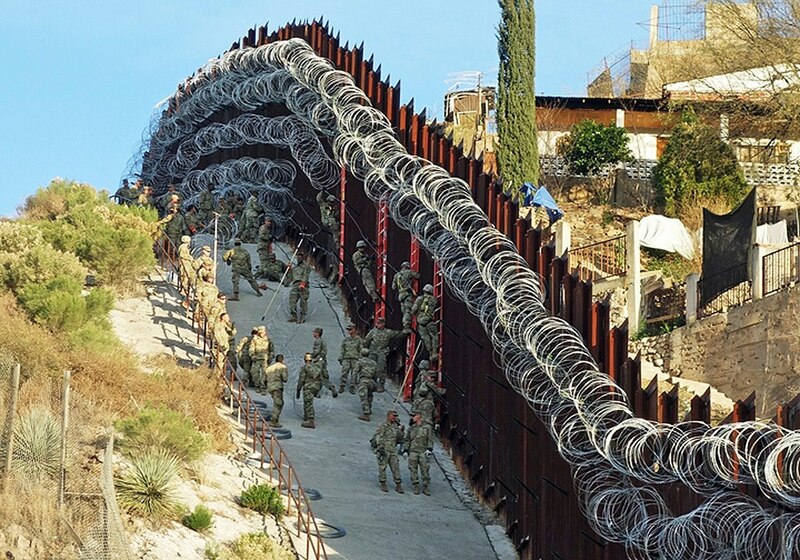 The council has stated that “placing coiled concertina wire that is designed to inflict serious bodily injury or death in the immediate proximity of our residents, children, pets, law enforcement, and first responders is not only irresponsible but inhuman.” They have also stated that the wire could harm anybody who attempts to scale the wall into the United States, despite the point that that’s exactly the point of the razor wire. The city of Nogales, Arizona, is threatening to sue the Trump Administration and the Federal Government if all of the razor wire on the city limits was not removed per their request. In response, Customs and Border Protection has stated that the only reason that more barbed wire was added in Nogales is that it was requested that “high-risk urban areas commonly exploited by criminal smuggling organizations,” i.e. Nogales, Arizona, should have more border security. CBP would not say who it was who tipped them off, however.